“Greater use of electronic medical records (EMRs) has the potential to improve the quality of medical care and has become a goal of the U.S. administration,” according to a 2005 report by Catherine W. Burt and Jane E. Sisk of HealthAffairs.org. As adoption of EHR has continued since the mid-2000s, few have argued that point. In recent investigations, the Office of Inspector General (OIG) has found that since 2001, 1,700 practices and facilities that perform Medicare evaluation and management (E&M) are shifting their E&M codes from 99211, 99212 and 99213 codes to the more complex and more expensive 99214 and 99215 codes. OIG investigations are continuing and no conclusions have been drawn, but it is clear that the practices and facilities that have been found in error are using EHR systems. As the news ripples throughout the industry, many suspect that the miscoding is due to EHR systems that are not equal to the task. CMS is incentivizing adoption of EHR, with the final Stage 2 Meaningful Use rule just issued last week, and will also penalize practices that fail to adopt the new technologies. Healthcare Reform legislation has made adoption of EHR systems a centerpiece, and the Administration believes that these systems can even effect an improvement in the economy. Yet the very systems that have been encouraged, promoted and incentivized, may be the source of tremendous amounts of miscoded billing. That these automated systems are under suspicion–and not inattentive billers entering codes manually–offers no comfort to physicians and practices that are being audited, investigated and fined. While EHR vendors boast of their systems’ data storage and retrieval features, their products seldom facilitate the physician’s individual work style. Instead, physicians find themselves conforming to templates and scripts that fail to require–or have no room for–the very E&M information they’ve spent their careers recording diligently by hand. The absence of data is, in effect, bad data, and when an office visit is reduced to a simplified, canned set of questions, information can be lost. Correctly coded billing is dependent on plentiful and accurate data, and without it, miscoding occurs. With investigations underway, some physicians and healthcare organizations that have dutifully complied with implementation of these systems feel they have been oversold. They’ve been promised that EHR systems and processes would enhance their operations, and for their efforts they have become exposed to audits and fines. Adding to the pain, EHR systems’ vendors typically require their customers to agree to contracts that disavow the vendor of responsibility for coding compliance and its proper documentation. Even though these systems produce non-compliant E&M documents when used exactly as specified by the product’s designers, vendors are absolved of their legal responsibilities. The consequences for these errors rest entirely on the shoulders of the customer. With CMS so deeply involved in the implementation of HIT, one might wonder how it can be absolved of responsibility. Isn’t it CMS’ role to ensure that HIT vendors provide products that are compliant and produce accurate documentation? Yet HHS’ Office of the National Coordinator has not established standards for how physicians should use EHR systems to create medical records that meet CMS documentation requirements for E&M services. Resolution of this issue is not yet in sight. ONC officials want more information regarding physicians’ implementation of EHR systems, and will be studying exactly which EHR systems the Medicare physicians under investigation were using. For more information see Modern Medicine’s The Problem with EHR and Coding, and watch this blog for Part II, Certified EHR: Suggested Ways to Move Forward. How Will Your Practice Transition Its Superbill to ICD-10? It’s difficult enough today—in ICD-9-CM—to ensure that your superbill encompasses as many of the diagnosis and procedure codes you report on a regular basis. How will you ensure that it continues to do so once the volume of codes increases exponentially when ICD-10 takes effect in 2014? Practices really need to start thinking about how they’ll revamp their superbill in preparation for the new coding system, says Mandy Thompson, CPC, coding and compliance consultant at Kraft Healthcare Consulting in Nashville, TN. Physicians don’t have the option to ignore the changes, as all providers must be prepared to report the new codes as of October 1, 2014, according to a proposed rule published in the Federal Register in April. ICD-10 won’t affect procedure or supply codes, but it will affect the diagnosis codes that physicians report. Thompson says that many of the physician practices she audits nationwide are already starting to develop a strategy for how they’ll revise the superbill to accommodate the new codes. The American Health Information Management Association (AHIMA) converted a sample superbill to from ICD-9-CM ICD-10-CM to demonstrate what the new form might look like. However, it cautions providers that the sample doesn’t represent an endorsement by AHIMA of the use of superbills or of this particular superbill format. Practices must determine how the ICD-9-CM codes they currently report will map to ICD-10-CM codes. In some cases, there may be a one-to-one mapping. In others, one ICD-9-CM code may map to multiple more specific ICD-10-CM codes. Compare and map all relevant ICD-9-CM codes with their ICD-10-CM counterparts. Complete a backward mapping by reviewing every ICD-10-CM code with its ICD-9-CM predecessor. Perform a quality review to remove inherent mapping flaws, clarify unspecified ICD-9-CM codes, and clarify combination codes and additional choices, etc. In addition, the AAPC offers on its Web site a code translator that allows coders to map codes from ICD-9-CM to ICD-10-CM and vice versa. However, the AAPC includes a disclaimer stating that this shouldn’t be the only tool on which coders rely. Practices can also purchase a specialty-specific crosswalk from the AAPC that includes the 50 most frequently-used codes. Specialty practices may want to consider creating one superbill specifically for diagnosis codes and another for procedure or HCPCS codes to accommodate the changes, says Thompson. Including the diagnosis codes on a separate page means that practices can print more code options from which physicians can choose. She says one orthopedic practice with which she worked plans to do this simply because of the sheer volume of code changes related to diseases of the musculoskeletal system. Lisa A. Eramo is a freelance writer and editor specializing in medical coding, health information management, and other healthcare regulatory topics. Visit her website at http://lisaeramo.wordpress.com/. Lisa wrote recently for Getting Paid on Take a Closer Look at Your Superbill to Ensure Accurate Billing and Prevent Denials with More Accurate Medical Coding. Lisa has also written on Understanding RVUs: Ensure Accurate Reimbursement for the E/M Services You Provide. There’s no denying it: Denials are the bane of every practice’s profit-and-loss statement. But the good news is: By setting up a process to measure, quantify and fix the reasons for denials, practices can significantly improve their collections and cash flow—and their bottom line. That was the message during Betsy Nicoletti’s recent Kareo-sponsored webinar entitled Stop Denials in Their Tracks: Get Paid the First Time by Health Care Insurers. Betsy is a well-respected practice management and medical billing expert, as well as founder of Codapedia.com. During her webinar, she provided a blueprint for minimizing the number of denials on the claims you submit, so you can take back the dollars you are leaving in payers’ coffers. Our first blog on her webinar offered ways to track denials and the reasons for them, along with some of the more common pitfalls that trigger denials. This last blog on the webinar will recap Betsy’s strategies for getting claims clean and complete enough to pass even the most exacting claims scrutiny. Betsy acknowledges that sometimes, it takes some detective work to determine the reason for denials. That is certainly the case with coding errors. A modifier might be added to the wrong CPT code, or modifier 59 may be added to a procedure that cannot be unbundled. Diagnostic tests may be denied because the provider failed to establish medical necessity by linking it to the correct diagnosis code. Or just as common, the test was performed more frequently than the payor allows. The solutions to coding errors are often found hidden in plain sight, in editorial comments of the CPT book. Betsy suggests you start there and read complete descriptions of codes along with the editorial comments. For complex coding issues, specialty societies can often provide information and supporting documentation and some will even field a few coding questions for free for their members. Other errors are more easily prevented and rectified, such as misspelling the patient’s name or entering wrong demographic information; failing to verify insurance and benefits prior to the appointment; or authorization errors, such as not obtaining pre-authorization or having the referral for services. Not filing claims on a timely basis can automatically trigger a denial, too. For all of these errors, Betsy recommends a “zero tolerance” policy that holds staff accountable for fulfilling the basics of claims submission. Finally, establish policies and procedures that set clear expectations for staff. They should include full registration at the time of the appointment; verification of eligibility and benefits; and authorizations prior to the appointment. Coding policies may include double-checking denials by another set of eyes before re-submitting them. By tracking, measuring, researching and fixing the reasons for denials, practices can give themselves a much needed raise. To hear more on other practice management or medical billing issues that impact or enhance profitability, view our archived webinars to find more topics of interest to you. If you would like to be put on our notification list for upcoming informative webinars such as this one, sign up now. Learn additional ways to improve your practice revenue: Register now for our next informational webinar, Finish Strong: Make 2012 Your Most Profitable Year! with widely respected consultant Karen Zupko. Superbills aren’t necessarily supposed include every code a physician might report. The superbill is typically a one-page reference of the most common codes used in a particular practice. This is by far the most common mistake that practices make, says Thompson. Practices using outdated superbills run the risk of receiving countless denials due to extremely repetitious errors. At a minimum, practices should review the superbill annually when new codes take effect. New ICD-9-CM codes take effect October 1 every year. New CPT and HCPCS codes take effect each January. Practices should also monitor code changes every quarter when CMS releases its HCPCS Quarterly Updates. Although the superbill can’t accommodate every code that a physician might report, Thompson says some practices inadvertently omit codes that truly should be included. Hypertension is a common example. When this happens, physicians end up handwriting diagnoses at the top of the superbill in the hopes that coders will code them. However, handwriting is often problematic because it can be illegible and easily leads to incorrect coding and reimbursement. Also, if practices don’t hire certified coders or individuals who are thoroughly trained in coding who know how to look up diagnoses in a coding manual, these handwritten diagnoses may not even make it to the bill. Someone in the practice should monitor what physicians frequently handwrite and whether this information should ultimately be added as a permanent part of the superbill. Some superbills simply aren’t specific enough, says Thompson. Specialty practices should ensure that the superbill includes any relevant specialty-specific diagnosis and procedure codes in addition to chronic conditions, such as hypertension and diabetes. For example, dermatology practices should ensure that the superbill doesn’t simply provide one code for lesion removal. It should indicate that multiple codes are available and prompt physicians to document whether a lesion is benign or malignant as well as its size, location, and the number of lesions removed. The American Academy of Family Physicians (AAFP) published a superbill that practices can customize for their own use. One unique feature of this superbill is that it includes spaces for physicians to list up to four diagnoses, each of which they can assign a corresponding number. The superbill also includes a column titled “Rank” next to each CPT code so physicians can link procedure codes with diagnosis codes. From a policy standpoint, physician practices should ensure that coders always have an opportunity to review the medical record prior to coding—not only when they have significant questions about documentation, says Thompson. Unfortunately, this doesn’t always occur. Some practices require individuals performing the coding function to code straight from the superbill in the spirit of efficiency and multi-tasking. However, this is problematic for several reasons. Some physicians, for example, get distracted as patients ask questions, and then they forget to complete the entire document. For example, they may circle a procedure but no diagnosis. Immunizations are commonly omitted from the superbill even though physicians frequently render them during a patient’s visit, says Thompson. Practices that allow coding straight from the superbill also open themselves up for increased scrutiny of the E/M codes they report. Many physicians make costly mistakes when they under-report or over-report E/M codes simply because coders can’t review documentation to verify the specific level E/M assigned. Thompson says auditors don’t audit based on the superbill—they audit based on the record. Although many smaller practices still use a paper superbill, larger practices have likely transitioned to an electronic one, says Thompson. Not only do electronic superbills eliminate legibility challenges, but they also include a greater volume of codes. Coders also no longer need to guess which CPT code(s) a physician circled or debate whether a code appears to be partially circled. Some medical billing software solutions may allow physicians to securely email an electronic superbill to an internal or external biller. All of these advantages can potentially increase efficiency and reduce denials. Lisa A. Eramo is a freelance writer and editor specializing in medical coding, health information management, and other healthcare regulatory topics. Visit her website at http://lisaeramo.wordpress.com/. Lisa wrote recently for Getting Paid on Avoid These Mistakes When Appealing Denied Claims and Prevent Denials with More Accurate Medical Coding. Lisa has also written on Understanding RVUs: Ensure Accurate Reimbursement for the E/M Services You Provide. You can learn more about streamlining your billing processes in our next informational webinar, Finish Strong: Make 2012 Your Most Profitable Year! with Karen Zupko on August 30. Register now. 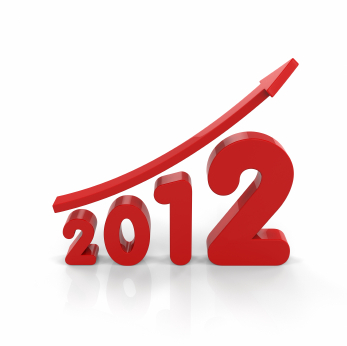 The homestretch of 2012 is in sight – for many practices, the end of the year is peak revenue generation time. In part 1 of this series, we took a look at some ways to be sure your systems and billing infrastructure are ready to maximize practice revenue from the uptick; now we’ll take a look at how to get the most volume from this peak season. Remind patients about their deductibles. Many patients will delay services because of high deductibles. Now is the time of year to remind them that they may be able to receive these services at lower cost if they’ve already fulfilled some or all of their out-of-pocket requirements. Create personalized programs and group programs. With today’s increasing emphasis on preventive care, many patients could benefit from personalized counseling for issues like cardiac health, diabetes, osteoporosis, smoking cessation, etc. Be sure your providers and staff are tracking this data in your EMR, so that you can easily identify the population that can benefit. Use your EMR to send them patient-specific information and you’ll begin satisfying another Meaningful Use criterion –and, you can encourage a preventive care counseling visit at the same time. Group visits work well for conditions that require significant patient education – for example, diabetes, asthma and cardiac problems – and they’re reimbursed by many payers. Developing a group visit program can allow your physicians to see more patients and increase their satisfaction, since many patients value the opportunity to share with others facing similar challenges. Give your referral partners attention. Be sure you’re thanking your most important referrers throughout the year, and not just at the holidays – thank them now and you’ll stand out from the crowd. Consider extending your relationships, too. For example, the ACA may be opening new opportunities for pediatricians, OB/GYNs and primary care physicians to work together, since young adults are more likely to have coverage (but they’ll need to move from their pediatrician to an adult medicine PCP), more OB/GYN services are offered without patient responsibility payments (birth control, for example – a key concern for young adult women), and more women will be well-covered for maternity and newborn care. Capitalize on the increasing revenue potential of extending these relationships in more than one direction. Vaccines can open the door. Fall and winter are vaccine time. Besides flu and school immunizations, newer vaccines for pneumonia and shingles have become important preventive measures for older patients. Vaccines themselves are not always profitable – in fact, rarely so – but they do open the door to providing other needed services. For example, the pneumonia vaccine is routinely given to healthy patients over 65, but also to younger patients with chronic health issues like diabetes or a history of cardiovascular problems. An alert to the patient about the vaccine could be combined with a screening for, say, osteoporosis for an older patient, or a follow-up visit for a younger patient with ongoing health concerns. Spiff up your web presence. Now is the time to get your website in order – if you’ve scheduled flu shot clinics or patient education opportunities, start promoting them on your website. Google your practice and make sure your address and phone are listed properly wherever they appear. Claim your listings on medical directories like Avvo, Healthgrades and Vitals – you’ll be able to customize them with detailed information about your practice, plus get the SEO benefit of a link back to your own site. Be sure also to claim your Google Places record and flesh it out. Charge appropriately for add-on services. Patients often need paperwork in the fall – especially pediatric patients, who need health forms for their schools and sports activities. Be sure you’re charging a fair rate for these services – which can be quite time-consuming. And make sure your fee information is clearly available to patients, to avoid misunderstandings. Laurie Morgan is a management consultant with Capko & Company. She specializes in marketing, management and technology for medical practices and blogs about practice management issues at www.capko.com/blog. Laurie has a BA in Economics from Brown University and an MBA from Stanford. Laurie recently wrote for Getting Paid on ACA Is Upheld: Will Medicaid Be Your Next Payer?, Staying on Top of Business Trends to Protect and Build Your Medical Practice, and My Receivables Are Growing: Time for a New Billing Service? Read part 1 of this series now. 2012 is now more than half over. Many practices have their biggest revenue opportunities in the last few months of the year – so, now is the time to set your practice up to make the most of the home stretch. If your medical practice revenue tends to be a bit slower in the summer, use some of that downtime to get ready for fall. - Denials. The quickest path to getting more revenue is to stop losing it; expend less effort collecting your revenues, and you’ll also immediately increase profitability. Analyze denial codes for patterns you can correct. Often, the reason for denial starts before the encounter; e.g., names and addresses that don’t match, missing preauthorizations, or terminated coverage. If errors are happening at your front desk, now is the time to make sure everyone is fully trained on their role in the revenue cycle! Also look for provider patterns – to determine if, say, one provider in your practice is consistently miscoding or not providing adequate documentation. - Receivables analysis. Ballooning receivables provide false security by suggesting that large sums of money will materialize “eventually.” In reality, receivables that go past 90 days are unlikely to be collected – especially if you try to do it yourself. Now is the time to develop a clear-cut policy on handling patient receivables – including outsourcing appropriately. - Contract review. Are you always getting paid the allowable amounts based on your contracts? It’s not uncommon for payer errors to short-change a practice consistently for certain codes – say, because of a system error on the payer’s side. A loss of even a few dollars on an important code can cost your practice thousands over the year – on the flip side, sniffing out such an error is like finding free money! It’s especially important to do this before your volume increases. - Payer review. Have contracts that are expiring this summer? This is the perfect time to eliminate unprofitable payers and strengthen your ties with your most important payers. - Staff overtime. Review your overtime expenditures for the first few months of the year. If one or more employees are consistently earning overtime, that’s a red flag – and a bite out of profitability. If your practice consistently pays overtime, you may need to add staff to fill the gap. Adding staff costs less per hour than overtime – and, your new members will be contributing their most productive hours, rather than trying to do more work while already tired from a full day. - Seasonal provider staffing. Many practices could profitably operate weekend and evening clinics during the fall and winter, but hesitate because providers don’t want to work those hours, or because they’d need to pay overtime. When mid-level providers can handle the patient load off-hours, PRN staff can fill these roles without breaking the bank; develop a relationship with one or more local agencies and/or with particular providers who are interested in working these unpopular hours. Coming up in Part 2: Developing new services and using marketing to maximize the busy season. Laurie Morgan is a management consultant with Capko & Company. She specializes in marketing, management and technology for medical practices and blogs about practice management issues at www.capko.com/blog. Laurie has a BA in Economics from Brown University and an MBA from Stanford. Laurie recently wrote for Getting Paid on ACA Is Upheld: Will Medicaid Be Your Next Payer?, Staying on Top of Business Trends to Protect and Build Your Medical Practice, and My Receivables Are Growing: Time for a New Billing Service? Many large groups have a dedicated compliance officer and even (gasp) compliance auditors and support staff whose only responsibility is compliance. For smaller groups, compliance duties are shared by the manager, physician leader, and billing and coding staff, all of whom have multiple other responsibilities. How to find time? And if you are able to steal time from another task, where do you start? Here are three important activities that won’t take all day, but will protect your practice. Print out a list of billed CPT codes by volume and revenue, and ignore E/M services. Make a list of your top five codes billed by volume and revenue. In all likelihood, some codes will be on both lists, so you will end up with a list of five to ten of your most frequently billed non-E/M services. Next, review the CPT definition for the codes, read the editorial comments in the CPT book related to the services. If you have any other up-to-date coding resources about the codes or coding instructions from Medicare on one of your payers (a National or Local Coverage Determination, for example) print that out and review it as well. Next, pull five records billed with each of your most frequent codes. Review the documentation. Does the documentation describe the procedure as defined by CPT? Does the note support the medical necessity or indication for the service? If the service is diagnostic, is the reason for the test documented in the record? Document your findings on a spreadsheet. Refund incorrectly paid amounts and educate your staff and providers. CMS is serious about enrollment and accurate claim submission with the correct NPI. Locums, shared services, and incident to service have specific rules. For this compliance review, trace the NPI on the claim submitted with the name in the medical record documentation. Do they match? Is the correct NPI being submitted in both the electronic and paper formats? If there is a discrepancy, was it because of a shared service, incident to or locums billing? Record your findings on a spreadsheet. Errors in this are serious and most consultants would recommend talking to your practice attorney about discrepancies. Review your security policies frequently at staff meetings and with new staff. Make sure no one is using a non-secured email to send or receive patient records. Finally, schedule yourself an hour a week to just read about coding and compliance issues in physician practices. Turn off the phone and email, and find a hideout. Go to the library or a coffee shop. All week long, save the articles, emails and resources that appear in your electronic and paper inbox. During this learning hour, catch up and give yourself time to process all of the information coming your way. If an ounce of prevention is worth a pound of cure, an hour of learning will save weeks of pain. A 2011 survey by Merritt Hawkins Associates, a major physician recruitment firm, showed that a salary plus a production bonus was the type of compensation formula offered to physician candidates in 74% of the physician search assignments. The survey also showed that in 50% of searches, the compensation formula was based upon RVUs (or WRVU’s). 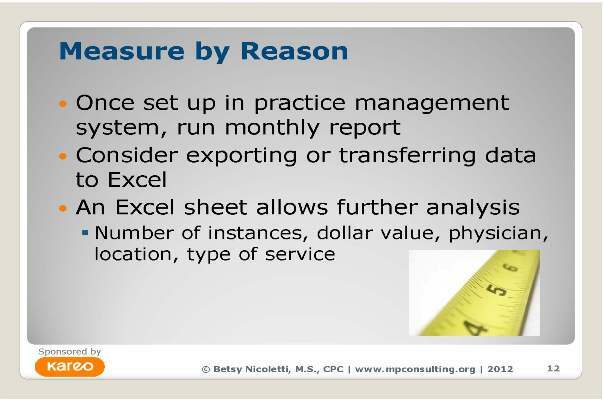 Of note is the fact that in most cases the productivity measurement was NOT based upon quality of care, patient volume, any cost effectiveness metric or revenue generated. Besides RVUs or WRVUs, there are other ways to measure clinical productivity. Patient encounters are easily measured but do not reflect actual collections and gaming of the system is possible by encouraging short patient visits. 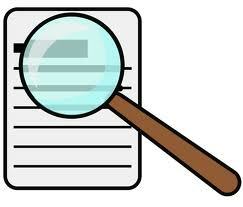 Gross charges are also easy to calculate but do not reflect contractual adjustments or collections. Charges adjusted for insurance contracts are relatively easy to produce but are based on uncollected charges and since payer mix can vary between physicians in the same group, does not allow apples-to-apples comparison with other physicians. Net collections do reflect actual collections but may discourage physicians from providing care to uninsured or poorly insured patients. In some groups, a combination of one of the above methods may be in use that takes a middle ground. Unfortunately, a number of physicians are either not aware of the details of productivity formulas, billing procedures or the group simply does not track RVUs or WRVUs. In a recent industry survey, the percentage of physicians who say they are unaware of billing and administrative decisions is about 10%. A recent survey of Vascular Surgeons (1/3 academic) showed that only 50.3% said they or their group kept a record of RVU’s/WRVU’s. About 70% stated some of their compensation was based on productivity, with 48% stating their productivity determined 76-100% of their compensation. More physician-owned groups reported that their compensation was based on productivity than full-time employed Vascular Surgeons. Net collections was the most common measure of productivity (35.3%) followed by WRVU’s (24.8%). Most groups use common benchmarks such as MGMA or AMGMA data for the productivity part of compensation formulas. A problem with tying physician compensation strictly on a per RVU or WRVU production is that when insurer payments change or groups have a bad year with a negative operating margin, the model may not be sustainable. As I have previously discussed here, RVUs as the only basis for calculating physician compensation has its drawbacks. Collections are after all still king. For instance, for PCP’s, in addition to RVU or WRVU productivity, achieving benchmarks for management of chronic diseases like diabetes or hypertension, patient satisfaction, care coordination and other important functions must be in the mix. This is becoming more important with the medical home concept. Participation and contribution to the group’s overall strategic plan should also be rewarded. These new incentives may create some confusion, but physicians will begin to see the model as fair and transparent over time. In general, it is recommended that any behavioral change incentive must constitute at least 20% of the total compensation plan to get attention. Accountable Care Organizations (ACOs) are being established in every state. Large and small physician groups are now becoming part of ACOs especially in large metropolitan areas. In the last count of 221 ACOs, 70 were physician-based. In addition to Medicare ACOs, commercial ACOs are also taking off. If the goal for physicians is to be a big part in reducing the cost of healthcare in the U.S, compensation models for physicians must also be aligned with incentives for ACOs. Therefore, “productivity” must include measures other than clinical productivity. For instance, to maintain quality of care non-financial incentives must be created. These metrics can include: patient satisfaction scores, mortality and morbidity rates. ACOs will also need physicians to lead in the operations, innovation and quality and customer service areas. One such metric is to assign each of these activities a WRVU, which is then multiplied by the number of units on an annual basis. For the physician side, it is clear that reimbursements are not going up. In most groups there is usually a physician who assumes an unpaid administrative role and works with the business manager or the most senior physician simply has the manager reporting to him/her. This worked well when reimbursement was good and overheads relatively low. With operating margins decreasing and reimbursement dropping, not only do physician groups need a well-educated manager, but a physician who is knowledgeable, keeps up with the changes and can look at future opportunities for growth. With Medicare ACOs, for instance, beneficiaries will have the choice to go and receive their care outside your ACO and you will have no control over costs. So, physician leaders will have to be intimately aware of costing, budgets and financial controls. Therefore, in medical groups of varying sizes, the administrative physician must be compensated or be given credit for these activities when calculating productivity. We are using the Kareo insurance collection summary report to work on the High Dollar claims, Old Aging claims, Top 10 payers aging, etc. Here is the report customization for your reference. First report: You will get a report based on the Patient total value by Descending to Ascending order. Once the report is generated, we can start attacking the High dollar claims to get the best reimbursement for the provider. The provider will be very concerned about his High dollar value claims which have been submitted to the carrier. By generating and working on this report, we can increase the payment flow of the provider drastically. The output of the report will be generated as mentioned above format. 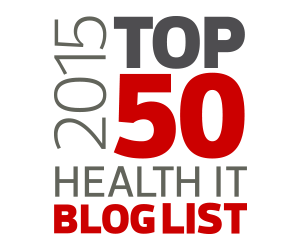 The Top 100 patient claims will cover most of your insurance aging. By working on these claims effectively, you can see a drastic change in the payment flow. 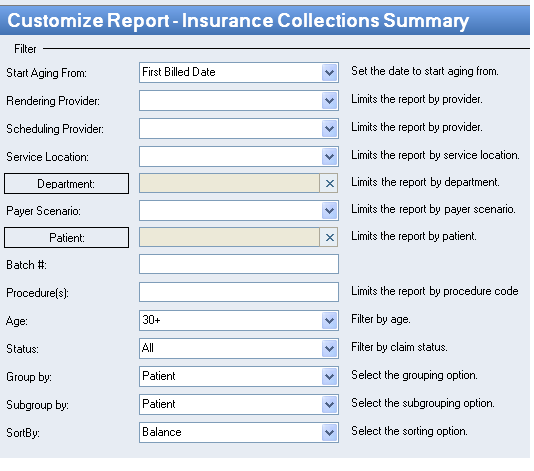 Second report: Use the same report, by changing the “Group By” status to “Insurance Plan.” The report gets sorted based on the Total outstanding aging for a payer by Descending to Ascending value of claims for a particular payer. By using this report, we can work on the Top 10 payers’ aging and reduce the aging of particular payers effectively. Third report: Use the same report, by changing the “Subgroup by” status to “Insurance Plan.” The report generates the patient claims which have High Dollar value, including the payer name. Note: By using the collection summary report effectively, cash flow for the provider will increase and we can concentrate on high billed claims. We can reduce the high value claims moving to 60+ aging. Please make use of this report to improve your cash flow. This is the second month in a row that the winner came from EccoHealth—they’re a fine organization, but how about our other billing service customers? We want to hear from you, and from those at practices, too; you are all eligible to win! Please be sure to submit your Medical Billing Tip of the Month to Marketing@Kareo.com by Wednesday, August 22, for inclusion in the next round of judging. We’ll post the top three tips on our Facebook page and on the Kareo blog for your vote! You will win a $250 American Express gift card if your tip is chosen. Good luck! Do you have a good handle on your claim denials? If you are like many practices, the actual rate of denials can be gray area in the black-and-white picture of your business’ health. But decreasing denials can pay huge dividends by increasing the flow of cash into the practice, lowering write offs and increasing productivity by helping staff do less re-work. 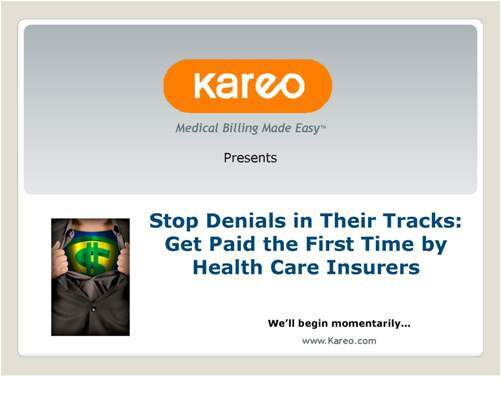 In order to help medical offices decrease denials and get paid the first time, Kareo sponsored a recent webinar by Betsy Nicoletti, M.S., CPC entitled Stop Denials in Their Tracks: Get Paid the First Time by Health Care Insurers. Betsy is a leading practice management and medical billing expert, as well as founder of codapedia.com. This blog will recap the first portion of Betsy’s presentation. The second half will follow in an upcoming blog. 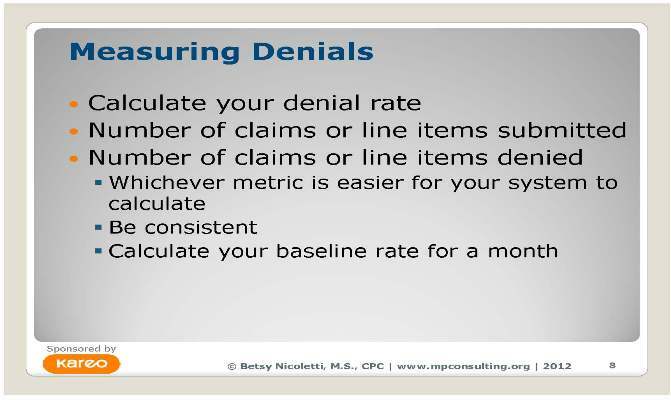 Betsy offers a systematic process for understanding denials and minimizing them as much as possible. The first step focuses on measuring and monitoring your current denial rate. According to the Medical Group Management Association, the average denial rate in a practice is 7 – 9 %. Do you know where you are? It’s important to establish a baseline. You can do this by calculating how many claims have been submitted, then measure the number of denials as a percentage of your submitted claims. Once you have entered a month’s worth of denials with associated codes, use a spreadsheet such as Excel to track the data. This makes it easier to monitor your denials and any trends by reason code. Start with your reports: what are the top reasons claims are denied? Select a few claims from the top three reasons and trace back the history. Understanding why your claims have been denied will help you create strategies for lowering your denial rate and bring more cash into the practice. Be consistent in tracking and be sure to use the same calculations month by month. Remember, re-submitting a claim without an understanding of why it was denied is a waste of energy. Learning the “whys” is critical to ensuring denials are not automatically written off. Our next blog on Betsy’s webinar will touch in more detail on the reasons for denials and how to fix them. If you would like to be put on our notification list for upcoming informative webinars such as this one, sign up now. You can also view our archived webinars to find more topics of interest to you. If you would like to learn more about Kareo’s innovative tools for streamlining your medical billing and collections, watch the demo.